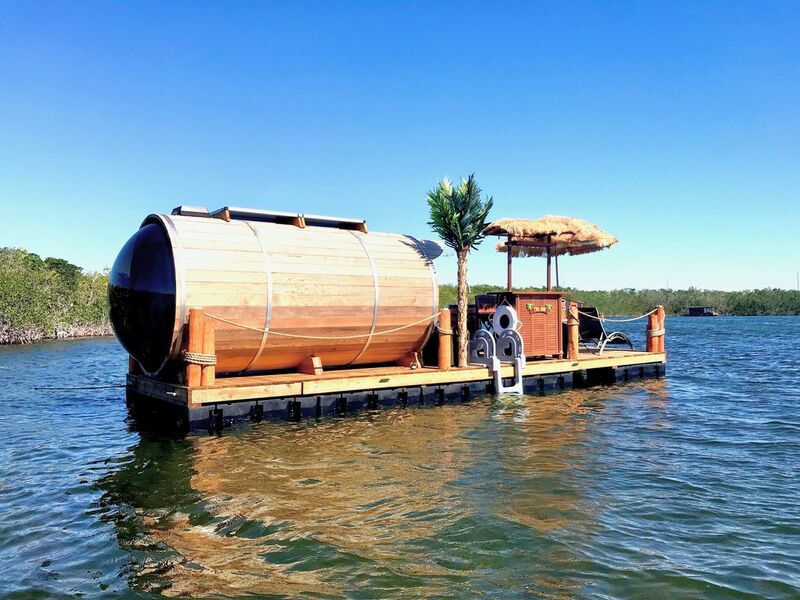 Welcome to “The Salty Seahorse” panoramic floating cedar barrel cabin in gorgeous Key Largo, Florida! This truly unique gem floats in the Gulf of Mexico. A one of a kind vacation rental experience that comes with your own personal water tender for transportation to and from shore. It can also be used for fishing, snorkelling or going for a stunning sunset or sunrise cruise on the water. Swim, fish and snorkel whenever you want right off your own secluded floating getaway! As you open the cabin door the beautiful smell of red cedar relaxes you and you can gaze out the panoramic window that overlooks the glistening water. Lay down on your comfortable queen size bed and watch as dolphins, tropical fish, manatees and other indigenous birds and wildlife pass by your private window into paradise. As you fall asleep at sea you can look up through your panoramic view and gaze upon the moon and stars, letting the sound of the water lull you to sleep. While floating on your own secluded private oasis, away from the noise and rush of the world, kick back at your onboard tiki bar. Here you can enjoy a cold drink and allow the warm breeze and tropical view to cause everything around you to slow down. If you have never had the opportunity to enjoy an outdoor shower surrounded by mother nature, then you are in for a treat. Stand underneath the gentle waterfall under the sun and wonder why you would ever want to shower indoors again. The whisky barrel outdoor sink adds a piece of old Florida Keys charm to your stay which happens to be conveniently placed next to the Coleman propane grill that awaits your catch of the day. At the front of your floating barrel cabin, under the shade of an umbrella, enjoy the stunning view on one of two lounge chairs. Inside the cabin is a flat screen TV and DVD player (please bring your own DVDs) as another small luxury available on your floating retreat. There is no antenna out on the water so please bring along your favourite entertainment. A chemical, odour free toilet is provided onboard and there is also an onshore bathroom and shower at the marina dock. This toilet is kept on deck but can be easily moved into the cabin for privacy or placed in the outdoor shower wash tub with the shower curtain pulled for privacy. However you feel most comfortable. Inside the tiki bar you will find all the necessities available to make your stay as effortless as possible: A Yeti cooler to keep your drinks and food cold, kitchenware (all of your plates, bowls, cups, glasses, cleaning supplies etc), a coffee press, as well as shower, bathroom, BBQ and outdoor utensils. Your towels and bed linens are also provided. Our wonderful online and on location hosts will be in touch with you from booking onwards and will be there at the marina to greet you, show your your private dinghy, explain your cabin and then leave you to relax! Check in must happen between the hours of 2 and 4 so please arrange to arrive early and grab a bite to eat or cold drink at the Blackwater Siren while you wait. Once you’ve arrived at the marina with secured, onsite parking (please bring $10/day cash for the marina), and have boarded your private 9.4ft SunDolphin water tender dinghy, you will embark on the 15 minute ride to your cabin. As you begin your adventure you will pass local hot spots such as Blackwater Siren restaurant with great food, entertainment and drinks, as well as Gilbert’s Restaurant which boasts the largest Tiki Bar in the Florida Keys. There you will also find great food, drinks, live entertainment, as well as lounge chairs on a beautifully maintained beach available for you to relax, order food or a drink, and perhaps dive into a long awaited novel. Jet ski rentals, kayak rentals and other water sport activities are also available on the beach. “The Salty Seahorse” panoramic floating barrel cabin is a completely green energy powered unit, running off of solar power, making it one with nature and a friend to the beautiful wildlife the Florida Keys has to offer. We have no doubt that a stay with us on our little piece of floating bliss will be an opportunity for connection with nature, a loved one or simply yourself. This is an outdoor experience reserved for camping, adventurous people. Please do not book this if you cannot be flexible with weather, wildlife or the water. You are on the water and on a still night there may be mosquitos so please come prepared with your choice of bug repellant. As a reminder, like camping, there is no AC. We do offer an exhaust fan, bedside fan and a bug screen so you can keep your door open during the night. Seeing as you are in the Keys you most likely won't be spending your days in doors, so just bring light sleeping attire to keep you cool. We do not offer full refunds if you cannot make it due to travel delays, bad weather or user error with the units. Please pack light! You reach your unit with a 9.4 foot dinghy and large suitcases will both take up space and weigh down your boat. There is weight requirement due to the size of our tenders, all cargo (humans and baggage) cannot exceed 450 pounds. There is also minimal storage on board. We advise that if you are staying in the area for awhile that you pack an overnight bag to take while you campout on our units. Guests must be relatively fit to be able to climb in and out of dinghy, climb swim ladder onto unit and spend their vacation in a smaller area. Check in times are 2-4, no exceptions! Our on location host will be in touch with you prior to your arrival to set a more firm time and we ask that you respect her time and arrive within the alotted time. There will be a fee if she has to return to the marina after hours to check you in. Absolutely NO CHECK INS AFTER SUNDOWN. If significant travel delays happen you will need to find other accommodation for the night as we cannot check in a guest after dark. We wanted to explain our cleaning fee. Yes, we do understand it is higher than most around the area. Our housekeeper has to haul jugs of water to the units on a dinghy, along with linens and other cleaning supplies, she removes and empties the toilets and requires the extra time to boat to and from all the units. We truly appreciate when our guests leave the unit tidy, as does our lovely housekeeper :) Thank you for your understanding, and we cannot wait to host you on your amazing floating vacation! The owner and local host were superb, very attentive. Amenities were clean and very well maintained. Fishing and enjoying the views kept us entertained throughout our stay, and the dinghy gave us the opportunity to explore around a little too. The Blackwater Siren and the tiki bar/restaurant at Gilbert's Resort were a short boat ride away and have excellent food and drink. Lake Surprise is large enough to allow for a good, constant breeze, and small enough to prevent big waves from rocking the house boat and making things difficult. As they say on the website, your stay is completely in Mother Nature's hands so keep an eye on the weather. We stayed in July and were "camping comfortable" sleeping at night with the fans on, or out on the deck in the lounge chairs. We had a pretty big squall come through while we were there, but once we got everything inside that we didn't want to get wet it was an awesome experience riding out the storm inside the tube. You were a great guest and we welcome you both back anytime!